Despite being the first game in the Monkey Island series to be made without the involvement of creator Ron Gilbert, The Curse of Monkey Island is no less essential. The Council is a great example of what adventure games have become today. Which is why last week’s news that it is on Steam and GOG is so exciting. 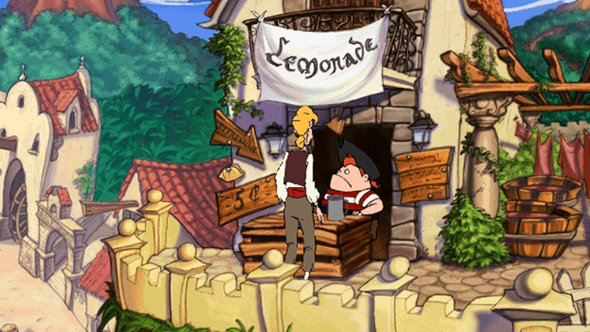 For years it has taken emulators like ScummVM to play the classic adventure game. Finally, a whole new generation can easily step into the awkward shoes of wannabe pirate Guybrush Threepwood, as he yet again attempts to thwart the evil ghost captain Le Chuck. 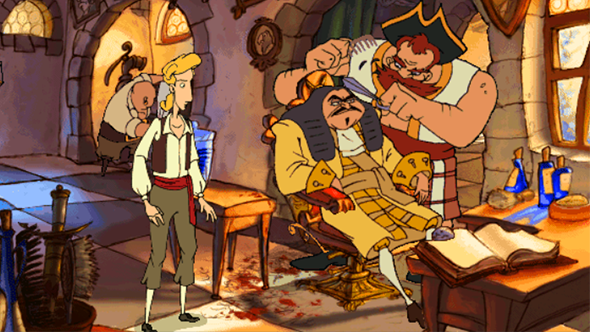 But what makes the The Curse of Monkey Island so great? While there are some jarring missteps – most notably in how it treats governor Elaine Marley, turning a previously powerful character into just another video game damsel-in-distress – it remains one of the funniest games ever released, and features some of the best puzzles in the series. What other game has you [Beware, me hearties, we be sailing into shallow spoilery waters! Argh! – ed]planting lice on a comb to get someone to shave off a vain captain’s locks? Or purposefully inflicting sunburn on a person’s back to peel off their map tattoo? The game is absolutely bursting with offbeat and creative ideas, the comic potential of every situation bolstered by the game’s expressive, cartoonish art style. There is never an avenue of opportunity that feels unexplored in the game, nor unrewarded. Every dialogue tree and interaction results in a hilarious punchline or a smirk-inducing Easter egg. In one example, I find myself struggling to locate the Voodoo Lady on Plunder Island. I try using a few of the items in my inventory with various objects on the floor of her shack – in one such experiment I use both the ember on a stick and pin I’m carrying on a voodoo doll sat nearby. Each action unlocks a short cutscene which shows Mort the Gravedigger – a character not yet introduced – being tortured by my actions. It doesn’t progress my cause, but it’s an example of the loving attention to detail that pervades the game. 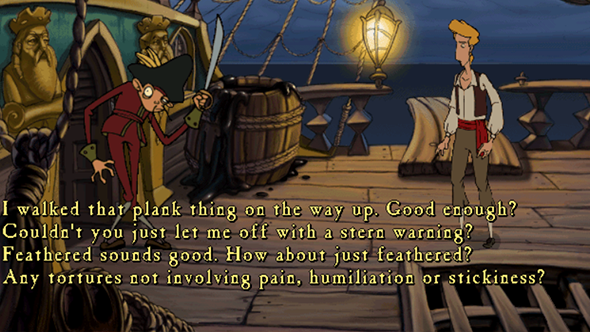 The Curse of Monkey Island is an adventure that begs you to exhaust all the available dialogue trees and try every possible interaction. Not only to experience the zany characters, brilliant one-liners, and the self-deprecating humour, but to see if the writers were clever enough to think of it before you did. It is almost always the case that they have. See if you can do better than me. Go grab your cutlass, pour a measure of grog in a sturdy flagon, and unwind with this classic of the adventure game genre. You won’t regret it.